Whether it’s a small new restaurant or a major art gallery exhibition, it seems Toronto’s cultural institutions must cater to the “like” seeking set. The price of success today is a sacrifice made at the altar of Instagram. Of course, to some, it’s not viewed as a sacrifice at all, especially when it boosts business and attracts tourists. But are we compromising the core values and uniqueness of Toronto by saturating the city with the same designed-for-Instagram aesthetic as other global cities? In a city full of restaurants and more than enough foodies to fill seats, if you lack Instagram appeal – whether your décor or the food – your new downtown restaurant isn’t as likely to generate buzz. We’ve reached a point where how a dish photographs is equally as important as how it tastes – and, sadly, that decades-old family recipe may get scrapped from the menu for something newer and more photogenic. While existing Toronto spots have had to amp up their Instagram appeal, other businesses have popped up that are seemingly designed specifically for social media – and Torontonians can’t get enough of them. At designer ice cream spot Sweet Jesus, it’s seen as a waste of indulgent calories if you mow down on one of the colourful and ridiculously over-the-top ice cream cones but don’t document the experience on Instagram. It’s been a destination spot since it opened in 2015: Instagram users with a sweet tooth will journey across town to wait in a lineup that could last 45 minutes just for that perfectly filtered Sweet Jesus photo. iHalo Krunch was met with the same success (and the same perpetual queue) when it opened up shop across from Trinity Bellwoods last summer to help countless Instagram causes with its photo-worthy charcoal ice cream. Elements that make restaurants into social-media magnets range from intricate, eye-catching floor tiles and graphic wallpaper, to art (especially neon signs), to – naturally – photogenic food. Some of the city’s most widely ‘grammed restaurants of late include vegan hotspot Planta (thanks to its leaf-covered green wallpaper), Oretta (whose art deco wall may as well have its own social media handle), Bar Reyna (where the creative and easy-on-the-eyes cocktails are served in things like copper pineapples), Junked Food Co. (where colourful offerings include things like Mac and Cheese Burritos and “Smash Bags” of nachos housed in Dorito bags), Frings (whose neon “6 on a Wave” sign has been splashed across countless social media accounts), and Grey Gardens (where “bathroom selfies” in front of the floral wallpaper are part of the dining experience). The question is whether restauranteurs can achieve widespread Instagram appeal without compromising chef’s vision or the dining experience overall. In many cases, it is possible, but there is a fine line between culinary creativity (something essential in a competitive city that has seen it all) and creating a gimmicky dish or cocktail specifically for Instagram. “I can’t say we developed cocktails or menu items for Instagram specifically, but overall, the world likes eye candy whether in person or on social media, so every single dish or cocktail needs to look appealing, as should the décor,” said Nicki Laborie, owner of Bar Reyna. “Sometimes we achieve an Instagram-worthy photo, and other times dishes and cocktails just look better in person.” At Bar Reyna, the “Mezcal Smokeshow,” is the top-selling cocktail (“because it’s damn good,” says Laborie), but it doesn’t photograph as well as the “Her Royal Highness,” which is served in a copper pineapple and has become the star cocktail for Instagram. “What I’ve learned is that you have to adapt to what potential guests are drawn to, and I know that in our first year, Instagram was the number one driver of getting guests to Bar Reyna,” said Laborie. Instagram has indeed become the modern-day restaurant referral, offering free and effective marketing for restaurant owners in a time when running a successful Toronto spot is tougher than ever, thanks to sky-high commercial rent prices and Ontario’s recent minimum wage hike. This has both negative and positive ramifications on the art world. On one hand, concerns arise when Instagram success comes at the expense of the artist’s work (much like a chef’s creations), when the art is created specifically to generate “likes.” On the other, it seems elitist to state that art can only be consumed in a conventional manner, and Instagram is credited for rendering art more approachable (i.e. less stuffy) and attractive to a younger audience. One of the most glaringly apparent examples of the effect of Instagram on Toronto’s art scene is the recently opened Yayoi Kusama: Infinity Mirrors exhibit at the Art Gallery of Ontario (AGO). By now, most active social media users have seen the bright, bold photos of the famed Japanese artist’s immersive exhibit grace their news feeds, accompanied by the much-used hashtag #InfiniteKusama. Like with Sweet Jesus, it seems sacrilegious to check out (if you were lucky enough to get an extremely limited ticket) and not snap a selfie – that is, if you’re quick enough to do so. After a 20-30 minute lineup, phone-clutching visitors are allocated just 20 seconds in the exhibit’s extraordinary mirrored infinity rooms. The social media frenzy around the exhibit can lead to questions of whether its Instagram appeal denies users a deeper and more meaningful experience with the art. Although Kusama has experimented with such concepts for decades, the mass popularity of the exhibit has given rise to the extremely limited timeframes to take in the works. “The way we’re experiencing art is changing; we’re in a very participatory culture right now, so I don’t think there is one right way to experience an artwork; it’s whatever works best for you,” said the exhibit’s interpretive planner, Shiralee Hudson Hill. “This work has certainly been popular on Instagram; there’s something about it. Traditionally in art museums, we’re told not to touch, but her works are open, and so inviting, welcoming, bright, and colourful that it all comes together in these wonderful participatory moments in the show.” She highlights the exhibit’s universal themes and approachability as entry points to both the art world and the AGO to new audiences. Notably, there is one work in Kusama’s hot-ticket show, “All the Eternal Love I Have for the Pumpkins,” where photography is not allowed, offering viewers the chance to experience the immersive art the old-fashioned way (granted in less than 30 seconds) rather than via a smartphone screen. Infinity Mirrors isn’t the only Instagram candy to hit the Toronto’s art scene as of late. Major public art initiatives are luring in millennials with offerings of like-worthy social media material. The Distillery Historic District’s recently wrapped Toronto Light Festival also offered no shortage of Instagram opportunities with its massive light installations (including one made with 200,000 hand-casted gummy bears) that made navigating the hoards of weekend crowds worth it for many once the “likes” began to roll in. Then there’s our cookie cutter Toronto sign. Taking a page from cities like Amsterdam and Guadalajara, the massive 3D Toronto sign that colours Nathan Phillips Square – an project initially in place for 2015’s PanAm Games and one that has already undergone a pricey nip/tuck – is also an Instagram star in its own right. The sign is now a bigger draw to the space then the impressively designed City Hall that sits behind it, which, somewhat ironically, was the product of a massive design competition. But the sign has worked at a time when travel media pumps out pieces detailing the most Instagrammable restaurants, art, and tourist spots in major cities. Perhaps for that reason, as of December, we have a new temporary tourist destination in the form of a 50-foot-long #TOWaterfront sign at H2O Park. 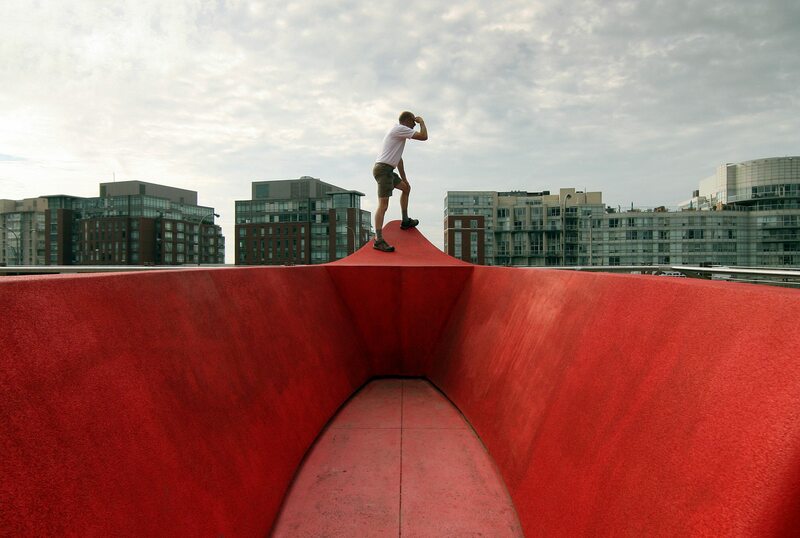 “Anyone looking for the perfect selfie has another spot to choose from this winter as Shore Land Arts unveil their latest creation,” read a press release from the Waterfront BIA that announced the installation. On the topic of Toronto’s waterfront and Instagram, of course, we also can’t forget the giant rubber duck (the world’s largest) that showed up on Lake Ontario last summer and was met with both thousands of snapping smartphones and backlash directed at the Province thanks to its $200,000 price tag. Critics called it a waste of taxpayer dollars and questioned the relevance of a massive yellow inflatable duck to the country’s Canada 150 celebrations. But Instagram users sure had a field day with it and, admittedly, it was later hailed as an economic boon for the city. In addition to public art, Instagram has also changed the way we design public space. Case-in-point: the highly Instagrammable “dog fountain” in Berczy Park in the city’s St. Lawrence neighbourhood (which sits in front of the Instagram-friendly Flat Iron building, constructed decades before hashtags were invented). The fountain is not exactly the most thought-provoking or culturally relevant, but nonetheless a major draw in a city of dog lovers, avid social media snappers, and summertime tourists. Naturally, Toronto isn’t the only city that’s become a hotbed for Instagram material. Infinity Mirrors hit Toronto after sold-out shows in Los Angeles, Washington, and Seattle, all of which made their respective rounds in Instagram. San Francisco’s Museum of Modern Art has added terraces designed as selfie spots, and Los Angeles’s Getty Museum has made mirror selfies easier by rearranging the mirrors in its decorative arts gallery. Of course, there is perhaps no more of an Instagram-friendly art institution than the Museum of Ice Cream found in Los Angeles, Miami, and San Francisco, which is quite literally an Instagram playground. Some London restaurants even supply users with “Instagram kits” that feature things like LED lights, tripods, device chargers, and selfie sticks. When it comes to Toronto, if we’re going to keep Instagram in mind in terms of urban planning, decision-making, and public art, things like cultural relevance, a strong backstory (which has successfully been accomplished with the current Instagram-worthy Winter Stations initiative), and longevity could be part of the equation so we can do more with it than slap a filter on a photo and post away. When chasing trends and creating for Instagram, we have a bit of a double-edged sword for Toronto’s culinary world, arts and culture scene, and tourism industry. We want people in Toronto galleries, restaurants, and tourist spots, and Instagram now plays a key role in facilitating this. But how unique is Toronto (not to mention, our personal Instagram accounts) to become if we’re opting for the same Instagram bait as other global cities in the form of a uniform millennial-catering aesthetic of neon signs, mosaic tiles, a giant city sign, and bright, over-the-top food that doesn’t taste as good as it looks? At the end of the day, substance over style – or a harmonious fusion of the two– should be the end goal.